When I started blogging, I knew nothing about blogging. It was all new, and I couldn't absorb enough information fast enough. There were so many things to do that I felt, and probably looked like I was all over the place. As we entered the first week in this new year, I had a conversation with my mastermind group about what things we learned big lessons from, or what we would have done differently starting out if we had known then what we know now. That means office hours, designated work space, assigned tasks, calendar appointments. Be just as serious about this job as you would be if you left your house to report to someone else, somewhere else every day. Guard those work hours. Meet your deadlines. Be intentional with what you do. And along with that, take time off. Working from home makes it VERY easy to work all the time. Work when it's work time, and don't work when it's not. When office hours are over, close it up and be fully present with your family in the off-work hours and week ends. I have currently set my schedule to have a day for professional development and newsletters, a day for client work, a writing day, a social media day, and a catch all day. If it had not taken me so long to figure this system out, I might be further ahead. Categorizing and batching your tasks will save you time, energy and money. If you need a template plan, check out this one. Looking back, the times that I have grown the most in my business have been directly related to the times I invested in getting advice and training from someone further ahead than I was. If I had to do it over, I'd hire a coach sooner. And I am not just saying that because I am a coach. I currently have a business coach, and I expect to for a long time. I don't think any of us ever outgrow the need for the wisdom, perspective and guidance of a trusted and experienced coach. If you are planning to sell anything, or write reviews that sell affiliate products marketing and copy writing education are just as or perhaps more important than blogger education. Starting again with a new blog I would spend less time learning the technical side of blogging (hiring things out as needed) to spend more time learning how to market well and with integrity. If you're interested, check out this list of a few of the books from my business and marketing shelf. View social media as a business tool. It's a different mindset than the previous keep up with your friends mindset. Set goals for social media and concentrate on growing the one where the highest majority of your audience is present. Schedule daily tweets and follow 100 people on Twitter every day. You don't have to understand Twitter, just do this. Large twitter accounts add to your authority and gain the attention of brands who will pay to be “talked up” to your followers. I use Hootsuite Pro to bulk upload tweets and then jump on periodically to interact and follow. Get on Instagram ASAP and engage with related niche hashtags daily. Usually you see “have an email list from day one” on these types of lists, but I did have that. If I had to do it over again, I would create my first product sooner, and then market it in every way possible. Again, the marketing thing is SO important. The bottom line is that you own your products, just like you own your list, and you can often get more income coming in sooner with your own product than just with ads and affiliate links. The reason I say that so often is that in the beginning, I let it kill mine. This is the pep talk I would give if that Katie were sitting across the table from me today: If you are going to blog professionally, you absolutely cannot compare yourself to anyone else. Your voice and life experiences are unique. Your message and delivery is unique. Your opportunities and the sphere of influence you have is different from that of any other person. Doing so will kill your joy, your contentment and your blogging career. You must define success as per God's calling on your blog and business, and then never allow yourself to measure yourself by any other standard than that one. 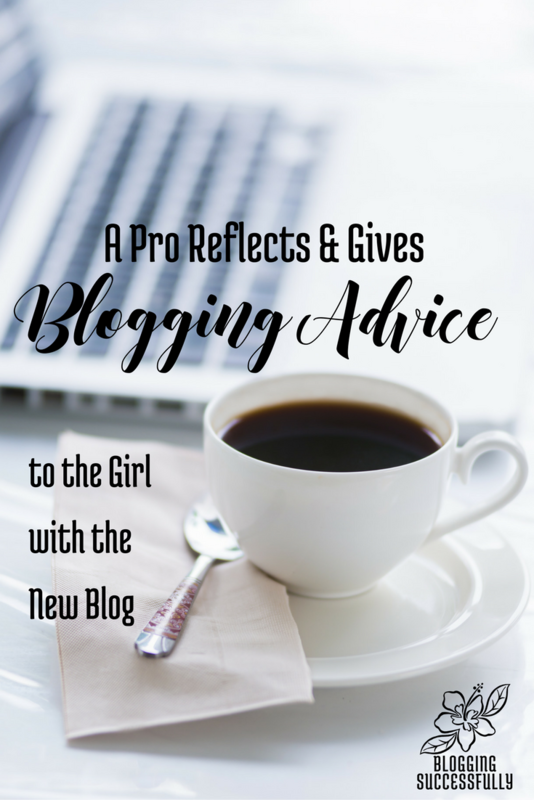 If you are the girl with a new blog, I hope you will take these tips to heart. Blogging professionally is a learning journey. Don't fret about the past, just keep going, keep learning, keep tweaking, keep making progress toward your goals. Before you know it, you'll be the one sharing the advice for the encouragement of another following in your footsteps. If you are struggling to grow your blog and would like to be a part of a blogging community that will help you take those next steps toward success, I invite you to check out The Blog Connection. It's so much easier to make progress toward your goals when you are surrounded by a caring community and have the resources at hand to propel you forward. Do you consider yourself a professional blogger? Please share in the comments, knowing what you know now, what is one thing you would do differently if you were to start again? Thank you so much for taking the time to write this. It really speaks to my heart. I have the awful habit of comparing my blog with others, my progress with others. I keep forgetting they those “others” have been doing this for YEARS, and I just got serious about this a few months ago. Thanks again for the encouragement, insights and advice! I am so glad it was a blessing! God’s plan and timetable for you are as unique as you are. Keep your eyes focused on the goal, not on those around you. You’re doing great! Good advise even though I’m not new, just trying to reinvent myself. Thanks for sharing. A year later and this blessed me so much. As I re-brand, I needed to read all of this.